When a patient is suffering from symptoms of strep throat in the Magnolia, TX area , there is no need to wait days or even weeks to be seen by your primary care doctor. 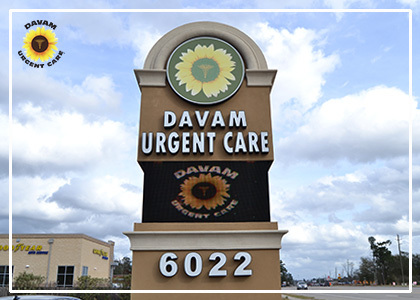 Waiting days to be seen or being treated at a freestanding emergency room are no longer your only options thanks to Davam Urgent Care located in Magnolia. Our clinic is open daily, 8am-9pm, to better serve you and your loved ones at a time most convenient with a busy schedule. In addition to our convenient hours, we also have a fully certified on-site lab to quickly test for Streptococcal Pharyngitis. Our on-site lab is also to perform other tests including flu a and b, rsv, cbc, cmp, mono, urine screening, and many more. Our patient care team is committed to providing a five star customer service experience for everyone who visits Davam. Our wait times are typically under 15 minutes to allow for patients to receive the care they need without taking up their whole day. We also provide up-front prompt pay pricing and are in-network with most major insurance carriers. If you or one of your loved ones needs strep throat treatment, and would like quick care from experienced and compassionate board certified medical providers, visit Davam Urgent Care in Magnolia, TX, today. Don’t forget to sign in online using our online check-in system to reduce or eliminate your wait time at our clinic. Davam Urgent Care conveniently serves the Magnolia zip codes of 77353, 77354, and 77355. Open daily, 8am-9pm.